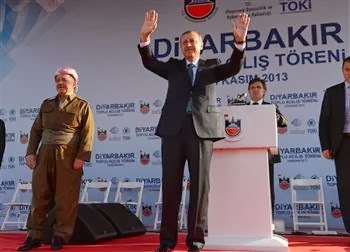 Kurdish President Masoud Barzani today joined Turkish Prime Minister Recep Tayyip Erdogan in Diyarbakir, one of the largest Kurdish towns in southeastern Anatolia region of Turkey, to address a huge public rally by the Kurdish population in support of Turkish-Kurdish peace process. “The time in the Middle East for living together has come. We can carry our people to happier days if we follow the methods of living together. Wars have been tried. The days when the blood of a young Turkish man was spilled by a Kurdish youth or the blood of a young Kurdish man was spilled by a Turkish youth are over,” Barzani added. The rapidly growing relationship between Barzani’s government in Iraqi Kurdistan and the Turkish government, and the Turkish-Kurdish peace process within Turkey, are the political manifestations of long-term economic and energy agreements between the two governments. The Turks are building a game-changing pipeline from the oil-rich region of Iraqi Kurdistan directly to Turkish oil terminal and refineries. When completed next year, the Kurds would sell their oil directly to energy-starving Turkey, making them even more independent from Baghdad, with Turkey being guaranteed a stable supply of oil through the pipeline, the least expensive method of importing oil. Meanwhile in islamic infested Iran a bunch of low life Iraqis in power are killing our citizens and causing our country harm. Get a life, will ya??? How are Iranian leaders Iraqis? In fact, Iran-Iraq's relations go back thousands of years..Saddam sought to destroy it but failed...I'll give you a hint.."Baghdad" is a Persian name..Go figure!!! These agreements come and go. Nationalist turks and separatist kurds at the ground level have no desire for these type of co-existence. Barzani, I recall that guy or his father who allied kurds with Shah against Saddam and then sold them. again like arabs kurds will start fighting with each other. io am sorry mt Uskowi to break the bubble but these people have no notion of tolerance or respect. i am not implying that we are superior to these people but facts speak for themselves. i don't think anything will come out of these. how many times turks have made peace with Greece/Greeks and always back to square one after a while. As the famous saying goes repect and tolerance is not in their DNA! the Guy above - 16th at-7:06 pm -is an imbecile ,he is living in a world of his own!. LOL B.M.A !! You out of all people has institutionalized the word and meaning of "imbecile" ! Personal attacks are a sure sign of frustration! But I will forgive your ignorance. @ Thanks for forgiving !-oh WHAT a noble virtue to forgive! .and speaking of personal attacks, you see m to know that you are just out of order to curse and attack Leaders here with some obscene language on false grounds. Many of them are Iraqis. Have bothered to check where the Larijani brothers were born?